The Democratic Unionist Party MP, Ian Paisley, has thanked Sinn Féin's former deputy first minister Martin McGuinness, a former IRA leader. He said his "remarkable journey not only saved lives but made the lives of countless people better". Mr McGuinness forged a friendship with Mr Paisley's father, former DUP leader Ian Paisley, when they were Stormont's first and deputy first ministers. Mr McGuinness is not standing in the Northern Ireland Assembly election. Image caption Ian Paisley Sr and Mr McGuinness formed an unlikely friendship in the top positions in government. He quit as deputy first minister in a row over a botched green energy scheme, sparking an election on 2 March. Who will succeed Martin McGuinness? Ian Paisley Sr and Mr McGuinness, who were once sworn enemies, formed an unlikely friendship in the top positions in government. They were even dubbed the "chuckle brothers" at one stage. When Mr Paisley died, Mr McGuinness said he had lost "a friend". Speaking on BBC NI's The View programme, Mr Paisley praised Mr McGuinness's contribution to the peace process. "I want to say thank you," he said. That really was a turn up for the books. Unionists had been generally qualifying any praise they gave to Martin McGuinness with a reminder of the fact that his early career was as a senior leader in the IRA. Ian Paisley was incredibly fulsome in his praise and his thanks. Obviously, this was linked to the connections the Paisley family built up with Mr McGuinness at the time when the late Ian Paisley Sr shared power with him and were labelled, initially by their critics, as the 'Chuckle Brothers', although in the end they seemed to revel in that description. Ian Paisley made it clear he was being loyal to Arlene Foster. But at the same time he seemed quite happy for people to contrast the picture he was painting of a more productive time during the 'Chuckle Brothers' era, with the recent frictions which led to the collapse of the Stormont institutions. 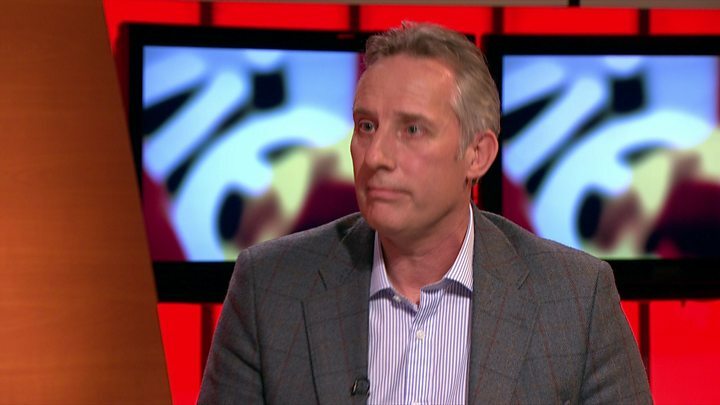 Sinn Féin's Conor Murphy told the programme that the late Ian Paisley and Mr McGuinness "were derided for the friendship they had, but people would like to see a few chuckles around Stormont today". Mr Paisley agreed with Mr Murphy saying: "Perhaps if we got back to some of that foundation work of building a proper relationship we could get out of the mess we are currently in." He added: "I can say thank you - honestly and humbly and recognise the remarkable journey Martin McGuinness went on has not only saved lives, but has made the lives of countless people in Northern Ireland better because of the partnership government we worked on and put together." However, Ann Travers, whose sister was murdered by the IRA when walking home from Mass in 1984, warned politicians to be "mindful of their language". "Having beaten a serious, life-threatening illness myself, I wouldn't wish the feelings of chronic fatigue and sickness on anyone," she said. "I wish Martin McGuinness well in his retirement and hope he has time to get over his health issues. "However, I wish politicians and commentators in general would be more mindful with their language. "The IRA stole over 2000 lives, and their actions still affect thousands more today. "Martin McGuinness has been allowed to go on a journey, many of the IRA's victims haven't. They were swept aside in a sea of political correctness."